A reader recently pointed out this image to me and I felt like it was worth posting. 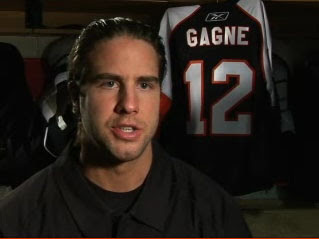 Is Simon Gagne being interviewed sitting in front of the new Rbk EDGE uniform of the Philadelphia Flyers? Decide for yourself. It's not a great image — it's in the background and it's facing backwards — but it's all we've got at this point. The Flyers have announced an unveiling date of September 16. We'll know for sure only then. Possible New Red Wings Uniform?